The first thing I noticed about the library's copy of Saga of the Swamp Thing Vol. 5 is that it feels slimmer than the Swamp Thing books that came before it (also it's the first one where the significant black ink seems to have smudged the pages). Indeed this book is only 166 pages, whereas previous volumes have been 200 pages or more. The six chapters here, however, are distinctly all of a piece, perhaps more so than any other volume in the series (Vol. 3 comes in second), and the fact that there's just six adds to and enhances this. The volume is far from self-contained -- in fact, it reaches back to the Martin Pasko stories that preceded Alan Moore's more so than any other volume so far -- but it lacks the single-issue stories and diversions of the previous books; Saga of the Swamp Thing Vol. 5 tells one story, very taut and methodically, through to its conclusion. After the considerably esoteric conclusion of "American Gothic" that saw Swamp Thing fighting beside angels and demons in the supernatural realms, Saga Vol. 5 returns relatively "down to earth." Abby Arcane skips bail in Louisiana after being charged with "unnatural acts" for her relationship with Swamp Thing, is recaptured in Gotham City, and is held there while Swamp Thing wages war on Gotham for Abby's return. 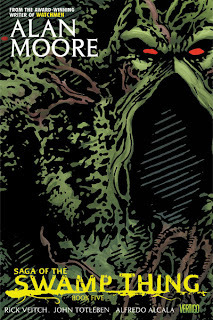 Moore does here what Moore does best in Swamp Thing -- interspersed with Swamp Thing facing off against Batman and bad guys (including Lex Luthor) plotting Swamp Thing's demise, Moore poetically narrates a gradual "greening" of Gotham City. As more parts of Gotham turn to jungle, the citizens revert to their baser forms with surprising swiftness; by the end, Gotham has become this wonderful and twisted Eden that I suggest only Alan Moore could conceive of. The book shifts from the war on Gotham in the first three chapters to the aftermath of the death of Swamp Thing in the second three. I can only imagine how DC might handle Swamp Thing's death these days, with die cut covers and tie-ins across the DC Universe; rather instead Moore offers two (somewhat, kind of) quieter single issue stories featuring Abby, and then Swamp Thing's bizarre cosmic return in the last. Doubtful anyone thought Swamp Thing was really dead in his own title, but I imagine this would have been fun to experience in monthly issues, in which the reader paused to reflect on the missing Swamp Thing for two months before he finally re-emerged. Issue #54 here is "quieter" only in the sense that it's more self-contained than the other chapters here; it is, to be sure, action-packed. The story is one of more traditional horror, and in this way it feels the most familiar in this volume among all the Swamp Thing stories. Moore uses Pasko's Liz Tremayne and Dennis Barclay here, not seen since issue #20 and not perhaps how Pasko might have meant them to be used, but Saga readers have only experienced them filtered through Moore anyway. With their presence, and with the callback with the desk ornament in issue #53 to the last time Moore killed Swamp Thing, also in issue #20, there is the sense of Moore's Swamp Thing coming to an end, as we know it will in the next volume, but as monthly readers might not have known then. In the years after these issues, readers have seen so much superhero death that again, these issues seem familiar when in fact they cast the mold that others used. The Swamp Thing memorial issue, #55, evokes both the statue erected for the dead Superman and also the one that Swamp Thing himself created for Hal Jordan after Final Night (it would be crazy if Scott Snyder demonstrated there's still a Swamp Thing statue somewhere in Gotham). "Blue Heaven," issue #56, in which Swamp Thing awakens on an alien planet, is a work of lyrical genius by Moore and master class in (all-blue) coloring by Tatjana Wood, but I'm also reminded of Hal Jordan's "Emerald Twilight," in which he, too, built himself a false reality only to see it torn down to the ground. Much as I praised Swamp Thing's uniqueness as the DC Universe's "peaceful warrior" in the last volume, the memorials and speeches in Swamp Thing's honor here do evoke again the difficulties I have with Swamp Thing's character. I think Moore has a tendency here to portray Swamp Thing as "too good," especially as the quintessential "perfect husband" in Abby's memory as opposed to the crazed Dennis. When Swamp Thing lashes out at Gotham, this is positive because it makes Swamp Thing appear more "human"; but ultimately if I had one nitpick, it's that I expect Swamp Thing to return to calm, Earth-friendly, non-judgmental, essentially perfect being before too long. If Vol. 3 contained good examples of "regular" Swamp Thing stories, then Saga of the Swamp Thing Vol. 5 is a good example of a Swamp Thing "adventure" -- conflict (with Batman! ), crisis, and Swamp Thing's rebirth. The persecution Swamp Thing and Abby face for their love certainly still resonates, too. This is my favorite of the volumes as well and I agree that Swamp Thing's terrorizing of Gotham is exactly the humanizing that the character needed to balance his growing invulnerability. Moore is one of those writers, whether he's handling Superman, Dr. Manhattan, or Swampy here, who never needs to 'power down' characters to tell a compelling story. His characterization of Batman troubled me at first, though. As much a fan as I am of the obsessive, territorial Batman of the Miller-verse (even Strikes Again and All-Star B&R) I found Batman's willingness to destroy Swamp Thing--with a gun-like weapon, no less--for the sake of the law which he rarely obeys himself uncharacteristic. His defeat, however, was hilarious and Batman eventually does own up to his mistake. I'm glad you mentioned Tatjana Wood's coloring work in "Blue Heaven" as well. Even as Swamp Thing is losing his mind trying to replicate Abbey, there's a calmness from the blue color scheme that is unique to that issue.